Lake level was full, the glory hole was 4+ feet over the bowl. 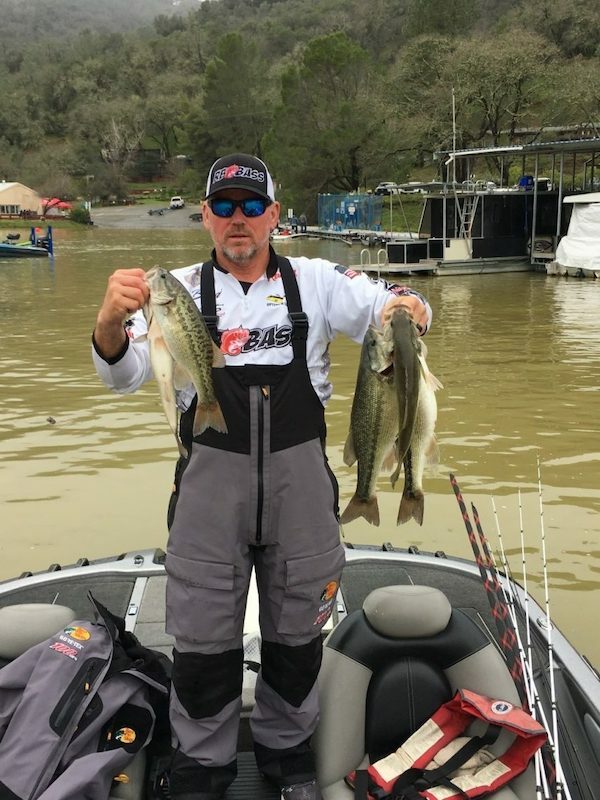 March 2nd was the opener for the Best Bass Tournaments Delta Wine division on Lake Berryessa. My fishing partner, Randy Walker and I pre fished on Friday the 1st. We searched up in the North end of the lake and marked fish. The water clarity up there was chocolate milk. The east side wasn’t as bad but still stained pretty bad. We fished slow all day and didn’t get bit up north throwing a variety of baits. What we call slow was probably still too fast. Our goal was to cover some water and hopefully find some active fish. We fished a variety of depths from 5-25 feet. The tournament the weekend before was won up north which is traditionally where the big girls hang out. We fished several spots on our way back south and into the narrows. The water in the south end cleared up but was still slightly stained as compared to what the lake normally is. While fishing some of the coves in the narrows we located fish exactly where they were supposed to be, out on the points. We looked for chunky rocks with a pretty steep fall. We let the fish bite but never hooked up and shook them off. Well, except for one. I couldn’t resist… This area is known for small mouth and spots. Occasionally you can find a large mouth. On game day we went to our first spot in the narrows. I hooked my first keeper after about 5 minutes and had my second one in the boat within the first 15 minutes. I missed a couple more in our first spot. The bite shut down and we moved on. We looked for similar spots. Randy caught a keeper a short time later. I must mention, the rain was coming down hard. We were cold and standing on soaking wet carpets in the boat. Thank goodness for great rain gear or otherwise we would be wetter than a bass’s bathing suit! The rain stopped around 1130 thank goodness. But so did the bite. We were starting to worry that we wouldn’t weigh in a 5 fish limit. We stayed positive, fished strong and tried many different locations. I caught the fourth fish and we were worried if it would make the 13” limit as the tail barely reach the line then finally the fifth fish. We stayed focused and within the last 30 minutes of having to head to the scales, I was able to cull the small fish. We made it to the weigh in right at our assigned time. Our five fish went 10.40 pounds and unfortunately we were first out of the money. All of my fish came on my Dobyns 734 Champion series with a Lews speed spool reel. 17 pound fluorocarbon Seaguar Inviz X line. I tied on a 3/0 Owner Jig Rig with a 3/16 oz weight. I used a 4” Senko 927. 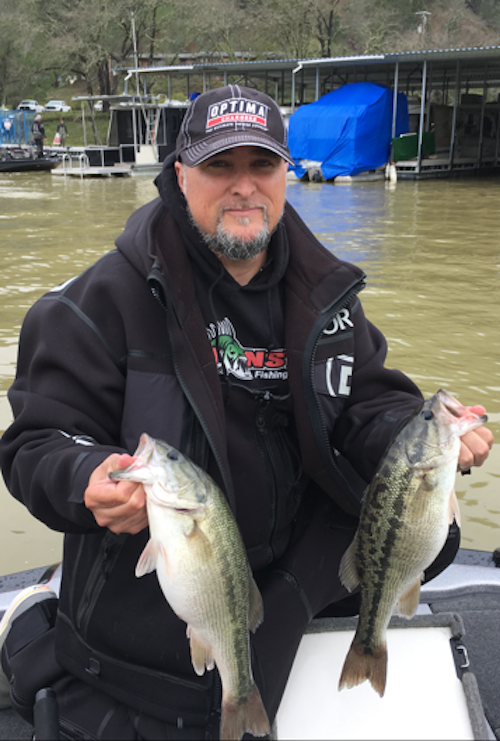 Randy’s fish came on a small green creature bait on a ¼ oz self-made ball head jig. We fished fairly clean only missing a couple fish. It would have been nice to fish clean. Most of my fish I caught I couldn’t feel the bite and only felt the weight and set the hook. When it’s that cold, the fish are pretty lethargic and we need to fish slow. We were fortunate to bring in a limit as there were a lot of teams that didn’t. Once this rain stops and the water recedes and starts to warm, lookout! That lake will be on fire. But until then, If you fish up there, fish slow. Be careful as there is a lot of floating wood. I don’t recommend going too fast so you can look out way in front of you. A lower unit can be pretty expensive. These 2013 Best Bass Tournament trail events are coming soon!